Follow The Banner, Glory Awaits ! This multi part set contains one 40mm round scenic resin base and one Orc Greatcoat Banner Bearer armed with double-barreled submachine gun and a banner. A veteran of many battles who is bigger, stronger and more aggressive then his fellow Greenskins is granted an honour of carrying a Warchief warbanner into battle. 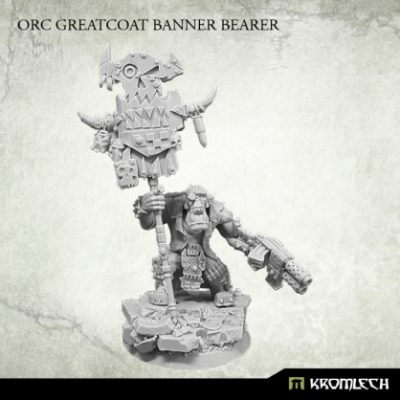 Orc Greatcoat Banner Bearer is designed to fit other 28mm heroic scale orcs minis.